Lovely private setting with fabulous ocean views. Located near Felix Neck wildlife sanctuary. Very peaceful with many birds and an occasional peacock is often seen. It feels very secluded yet it is within minutes of all the activities of Edgartown. It is two miles from Edgartown Harbor and a few minutes to a couple of Martha's Vineyard's most beautiful beaches. The house has a beautiful new gourmet kitchen with corian countertops and top of the line appliances. The bedrooms are all good size and have lovely views as well. There are three decks and and gas grille. Beach chairs etc. are already there. 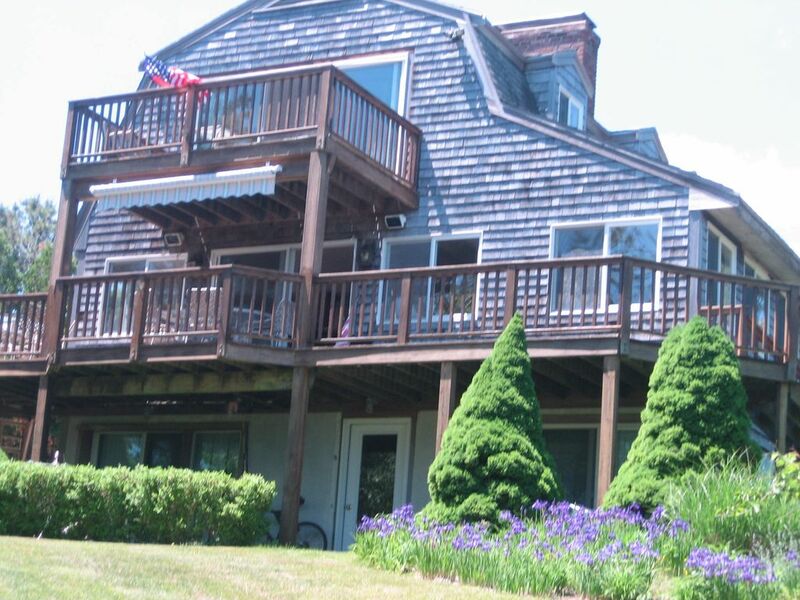 Enjoy our house and Martha's Vineyard this summer! We are a family with 4 children. They are now mostly grown up. We also have 4 grandchildren. The children spent their summers at this house going to the beach, camps, taking tennis and golf lessons and when they were older they worked on the Vineyard and were able to bike to their jobs. We have lots of wonderful memories of our Vineyard summers. We have been vacationing in MVY since 1978. We loved the privacy of this house and the views. It feels like you are really away on vacation, yet it is very convenient to whatever activities you want to do. This home has beautiful water views that are mesmerizing. The sunrise greets you in the master bedroom, and the deck off of the main floor is great for eating, relaxing, and enjoying the scenery. The home is very comfortable with an open layout and roomy bedrooms and an excellent outdoor shower. The rooms have ceiling fans that kept us comfortable even whether the weather turned hot. The sounds from the nearby gun club were a bit jarring on the weekend. The house had a great view. We enjoyed our stay with only one slight exception. The gun range is down the street and the sound of gunfire was a little distracting at times and intruded on the peaceful setting. The listing was accurate in every aspect described. The property could use a deep cleaning, but it was tidy and decent. I would recommend the property.